It would be extremely difficult to make the case that any competitive tablet in 2012 and perhaps even 2013 can hold a candle to the new iPad. Not only do I not believe that Apple competitors fully understand the tablet market but they have also not been investing in the kind of technologies needed to compete in this market. For many the tablet has simply been a me too strategy. Something that historically has either not worked or only worked for a short time thus not being sustainable. What you are forced to walk away with after evaluating the new iPad is that Apple is more serious about this new category of computing than anyone. I would also argue that they are also the best oriented to not only continue to define this new category of computing but to also dictate it as well. Every Android smartphone owner who goes gaga over their somewhat high resolution screen should thank Apple. The Retina display kicked off the trend of higher resolution phone displays. Once consumers saw, and are still captivated by that screen, it became very hard for a device to be successful at the mid to high end without a high resolution screen. The same will now be true of tablets. There will now be a resolution race to catch up with Apple’s Retina display on the new iPad. Which you absolutely have to see to believe. There has never been such a high resolution display on a mobile device and seeing such clarity and image quality on a bigger screen changes the experience with the device in a way I never imagined. Because of that there is nearly zero chance that consumers walk into retail, as many do, and check out the new iPad and even consider any competitive tablet that is on the market or will hit the market this year. I know that sounds harsh but as I stated the competition does not understand this new category of computing and they are not doing all they can to compete in it. Therefore, for the time being, the competition will not stack up to the new iPad. This hi-resolution race may also come in interesting ways to notebooks. 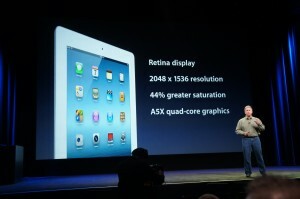 As I observed, once you see the retina display on the new iPad it is hard to look at other screens comparatively. This may be one of those things that becomes necessary to bring to every computing device. Its sort of like HDTV, once you went HD you would never go back. Apple is dictating the hi-resolution race and it is a great thing for the industry–as soon as the competition can catch up. If any area makes it more glaringly clear that other tablet vendors don’t understand the category it is software. My experience, and many others, line up with Tim Cook’s assessment of a lack of pure tablet apps on the Android platform. Several times a week I go browsing searching for tablet apps on my Android tablets and always walk away disappointed. There are a handful of great tablet apps on Android but when you compare that to app shopping / browsing on iPad it is night and day. Interestingly, I don’t think Apple gets enough credit at large for basically rejuvenating the entire software industry. Think about how passionate not only developers but also consumers are about software. When all that existed was notebook and desktop PCs I don’t recall such excitement over software. This has always been the case with the Mac community but that is a column for another time. If you think about it there is no reason glaring barrier to entry for great tablet software to be made for competing platforms. There may be economic, lack of desire, lack of understanding, etc, but nothing by way of technology inhibitors standing in the way. Apple on the other hand, has what I now consider an insurmountable lead with iPad apps and it will be at least two years, if not longer for other ecosystems to even get close. Even if they did Apple won’t stand still and two years from now their software ecosystem will be even bigger and stronger. So how do others compete? Honestly, at this point in time I am not sure. Apple’s vertically oriented strategy gives them such an advantage that makes competing with them, especially in tablets, extremely difficult. It appears that many Wall St. Analysts feel the same way. Many of the notes to clients I have seen so far make the bold claim that Apple is dramatically in front of competitors and are reiterating a strong buy for Apple. I am not saying that competitors should give up. Apple is challenging them to innovate and fully grasp this new category of computing. This is one of the most exciting categories of computing that I have ever encountered.